I love Hello Kitty. She takes me back to my childhood. I was a little girl who always had the "wants". One of my favorite places to go was the Hello Kitty store. I was so fascinated with the grab bags. 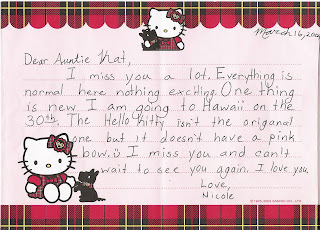 My dear niece Nicole is so thoughtful. She sent me this lovely little letter on adorable stationary. I love that she knows of my love for Hello Kitty. I also love that she remembered that I have very opinionated opinions about Hello Kitty's bows and attire. 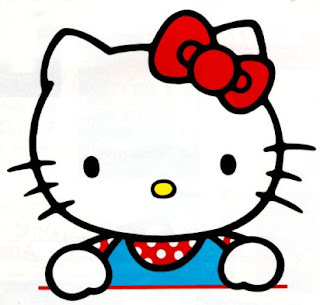 I don't like when Hello Kitty wears a pink bow. I also don't like when she wears pastels. I think this tartan bow is super cute but I will always like Hello Kitty in a red bow best. Am I the only one who has opinions about this? Nicole, isn't Hello Kitty's scottie puppy cute? Thank you for my sweet note, I will treasure it always. p.s. I hope you have a super fun time in HAWAII. I prefer pastels or hot pink on Hello Kitty. I couldn't get behind the dark purples that MAC put her in for the HK makeup. But then, I'm more of a Deery Lou girl. I had a feeling that you would be an fellow persnickety kitty. I hear you about the MAC Hello Kitty. Deery Lou is totally Stephanie.